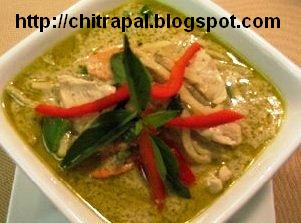 Prepare the green curry paste. Blend all ingredients into blender for smooth green curry paste. Heat oil in a wok or non stick pan. Add the green curry paste in pan or wok, keep on stirring for about 2-3 minutes until it is you can smell the spices and herbs. Add the chicken and let it cook into the paste for 3 minutes. Now add beans to the pan and cook, keep on stirring in between and cook it with a lid close. Add the coconut milk now, stir in and simmer until broth or paste slightly thickens. Enjoy hot with steamed rice.